Everyone has a part to play. A few take on many roles. A handful take them all. They’re not greedy; they’re simply determined. And perhaps, a little nutty, but creativity is nothing if not eccentric. “My friends call me honey badger,” said Natalie Wallace. Fierce and determined, the honey badger eats poisonous snakes, bares its teeth at predators and heads straight into bees’ nests for a little fun. “I have a rabid confidence,” she added. “It gets me where I’m going, but it also gets me in trouble sometimes. I tend to not care about that part of it,” she laughed. To say that Natalie is in the film business would be inaccurate. 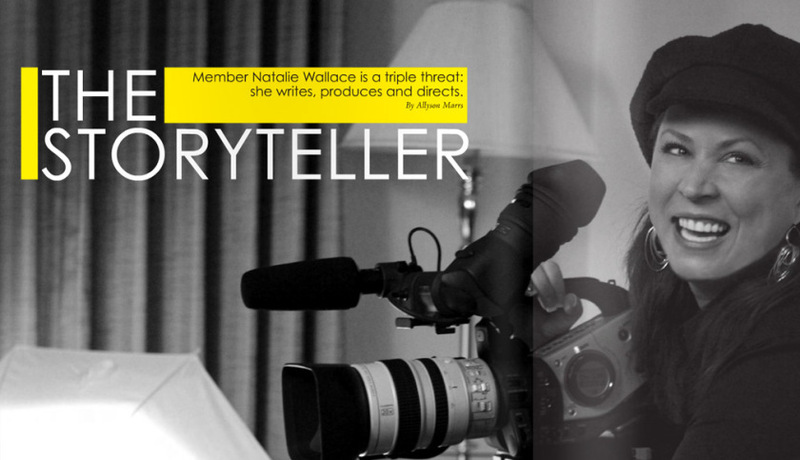 Natalie has a film business. But her path to the role of founder and owner of Platinum MultiMedia was anything but straight and narrow. Like many actresses, she takes on multiple parts. Some days, she’s a director. Other days, she’s a producer or a photographer. During long nights in the cave, she’s a screenwriter. It’s enough to keep her brain constantly buzzing. “My mind is so busy all of the time, all on its own with creative projects, lists, dialogues, wonderings and recounting, that if you add background music, people talking and main conversation, I’m outside sitting down in the quiet before you know it,” she said. Natalie waited until the ripe age of 10 before her first cinematic experience. “Orca, the Killer Whale!” was an inspired flick about a whale that went on a rampage, similar to “Jaws.” She still has nightmares. Even with the shaky introduction, her passion for film led her to a screenwriting degree from the University of Washington, but she took to memorizing lines before writing them, working as a commercial actress for companies such as American Airlines and Lifetime, appearing in 40 different advertisements in the Northwest. Eventually, Natalie’s natural curiosity led to questions—lots of questions. She torpedoed the cameramen and lighting guys with her thoughts, learning about various techniques, which eventually hammered out her role as photographer. She was soon volunteering to be first assistant director—who’s primarily in charge of talent—and learned how to be a crewmember. Over the span of 15 years, she transitioned from the talent in front of the screen to the talent behind it. But none of that was enough to satisfy her creative needs. Late at night and early in the morning, Natalie would hunker down, folding into imaginative worlds and endless characters while she wrote for hours between her day job as a paralegal. Occasionally, she would jaunt down to Los Angeles to take meetings and network, but learned that rubbing elbows became more important than producing ideas. “Once you’re in the machine, you lose your creativity,” she said about Los Angeles. “Everybody down there is a screenwriter. It’s kind of a joke.” Never being one to join the pack, she created her network of big executives in Hollywood and stayed in Washington to do the actual work. In her cave, she surrounds herself with movie memorabilia, four computers and hundreds of ideas. “It’s kind of like the command post for my creativity. It’s my bat cave,” she said. Within 120 pages, which generally includes a lot of white space, a story must find its ending. Then comes the pitch, and the fun begins. It was her foot in. She delved into writing, creating more worlds and personalities. Script after script, she pitched to the networks and studios, getting several ideas optioned, which is the first step. If Hollywood likes your idea, they’ll rent it from you—option it—for an extended amount of time while they try and package it. They’ll scour for producers, directors, cast and crew, and if time runs up, they’ll either option it again or drop the project. “I would say about 80 percent of what’s purchased or optioned never sees the screen,” said Natalie. But if they do start filming, the writer gets paid off. “No Submission” is a bloody, sweaty, violent documentary. It’s not a war movie, and it’s not a grisly crime drama. It’s a look into the world of Mixed Martial Arts (MMA) fighting, specifically following the life of Lyle “Fancy Pants” Beerbohm from Spokane. This fierce, competitive fighter gets his name from the bright-neon shorts he wears—shorts that his mother makes for him. Lyle is a recovering meth addict, who spent four years in prison on drug-related charges, passing time by watching the “Ultimate Fighter” on TV. Now, he does it professionally, and for the past year, Natalie has captured every moment of it. When she’s not filming jabs and kicks in the ring, she’s getting dirty with her own boys, who keep her busy. Her oldest, Gabe, 20, is currently serving in the Air Force. Garrett, 10, spends his time on the basketball court, and Zachary, 5, is perfectly happy playing. Her husband Kevin is a commercial real estate developer, lawyer and Bellevue City Council member. Although she’s always wrapping up one story and starting another, hers is far from over. It’s impossible to mask a creative nature and even harder to silence it, especially when parts are forever immortalized on film. “There’s a little bit of me in every character I write,” said Natalie. “Anybody who knows me knows I am full of mischief and sauciness. I love to shock people,” she smiled devilishly.